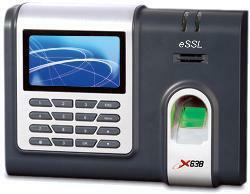 x628-C is an innovative biometric fingerprint reader for time attendance applications. The x628-C offers unparalleled performance using an advanced proprietary machine algorithm which is reliable, precise and has fastest fingeprint matcing speed. It comes with TCP/IP and RS-232 communication ports. An optional USB port allows administrator to transfer data when network isn't available. X628-C is also avilable with integrated Proximity (ID) or Mifare optin for multi-factor authentication. Special Feature: Push Data Technology. Id Card Capacity: 3000 Cards. Built-in USB port optional, allows for manual data transfer when network isn't available. Audio-Visual indications for acceptance and rejection of valid/invalid fingers.